Prins Claus Bridge was completed in 2003 but originally without any architectural lighting. The structure quickly became an iconic for Utrecht during the day. In 2009 the city recognised the value of sympathetically illuminating this elegant feet of engineering, so the Bridge could be fully enjoyed at night. 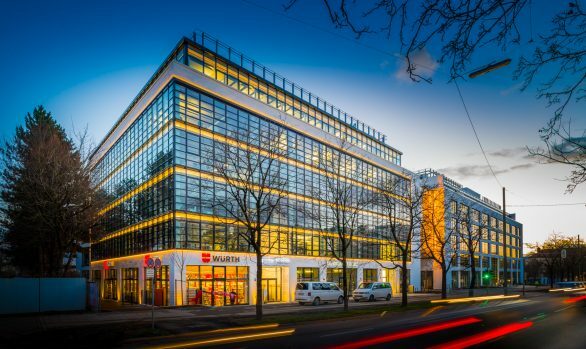 dpa lighting consultants worked closely with UN Studios, the original Architects and the Client to design a lighting solution that emphasised the sculptural qualities of the structure, whilst being careful with energy consumption. The idea to focus attention on the main pylon with its complex shapes, and the points at which the bridge connects to the ground either side of the canal quickly materialised. The lighting has been designed to show off the shape of the Pylon, with one face not directly lit, other surfaces illuminated and shadows from the cables allowed to emerge. The Bridge appears differently as you move around the adjacent areas, and particular effort was put into not illuminating the lengths of the cables, and just allowing a brush of light fanning across cables as they get closer to the structural pylon. The face of the Pylon orientated towards the city, is illuminated with carefully controlled narrow beam metal halide projectors, some with lenses located in the aperture between the two road decks so that they cannot be seen during the day, and do not glare drivers at night. The two side surfaces facing the canal are illuminated from carefully controlled metal halide projectors on a specially designed column, and the other surface is not illuminated at low level with just some narrow beam metal halide projectors, picking up the top of the pylon and creating shadows from the cables. Below the road deck the main pylon connects to the surface in a shape like a paperclip. Metal halide projectors have been located below the road to reinforce this shape visually, and connect the pylon with the ground. Again, as with the pylon above the deck, some surfaces are lit, and some are not to provide interesting modelling and emphasis to the elegant but complex forms. The underside of the road deck connects with the ground with a sweeping curve, and these curves are illuminated to provide a visual connection of the road deck to the banks of the canal. Efficient metal halide projectors carefully controlled have, as with other elements, been utilised here too. Immense care was taken in all aspects of the design process to reduce energy consumption and seamlessly integrate the new lighting with the Bridge. Photography courtesy of Wim van IJzendoorn.